You always know Advent is around the corner when the Feast of Christ the King arrives. How appropriate that the liturgical year ends with Christ the King, crowned in glory and majesty, and then begins again with preparation for the birth of this same King in humble poverty. But Christ can’t sit upon the throne of our heart if it’s already occupied. Sin can’t rule there, self can’t rule there, we must save that seat for Christ alone. Honesty and courage are needed – we must take a close look at our lives and tell the truth about those areas where we have not given all to Jesus. Compartmentalizing is a way of life for many of us; God is allowed in one or two areas of our life, but the rest is off limits. Jesus can’t be shut up in a little room off to the side, we have to give Him free reign! 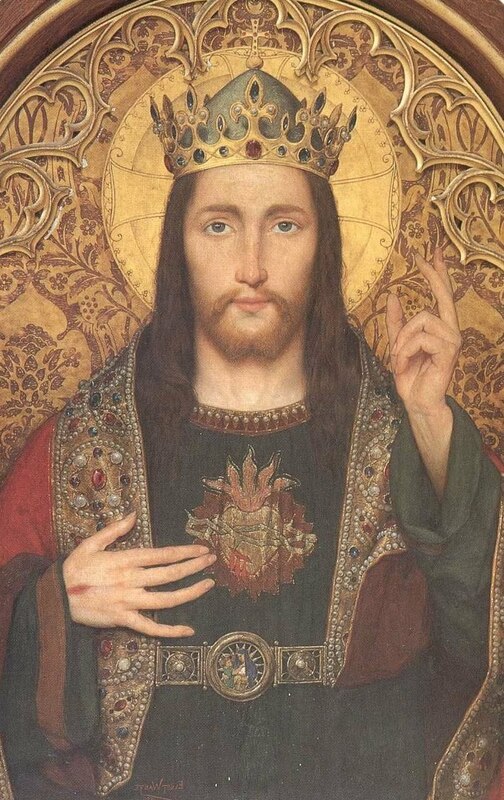 Pope Pius XI instituted this feast of Christ the King in 1925 because secularism was on the rise, edging God out, infringing on the rights and freedoms of the Church. It would be easy to get discouraged thinking about the progress secularism has made since then. But the encouraging news is this: each one of us can choose to live our lives in the service of Jesus Our King; God has given every soul He created the freedom to make that choice. What can one fervent heart accomplish against a world of indifference? Quite a lot. Never underestimate the power of one holy life, one faithful soul. A blazing fire begins with just one tiny spark, and each one of us is that spark when we allow Jesus to reign in our hearts and lives. This entry was posted in Uncategorized and tagged Christ the King, holiness, Pius XI, secularism, sin by srelizabeth. Bookmark the permalink. Yesterday I was trying to explain to a friend that is not Catholic why we celebrate this Holy Feast. Now it’s going to be easier. Thank you sister!